If you’re looking for raised bed ideas, from gardening for food or for flowers, this one is for you. I happen to have a raised bed addition. 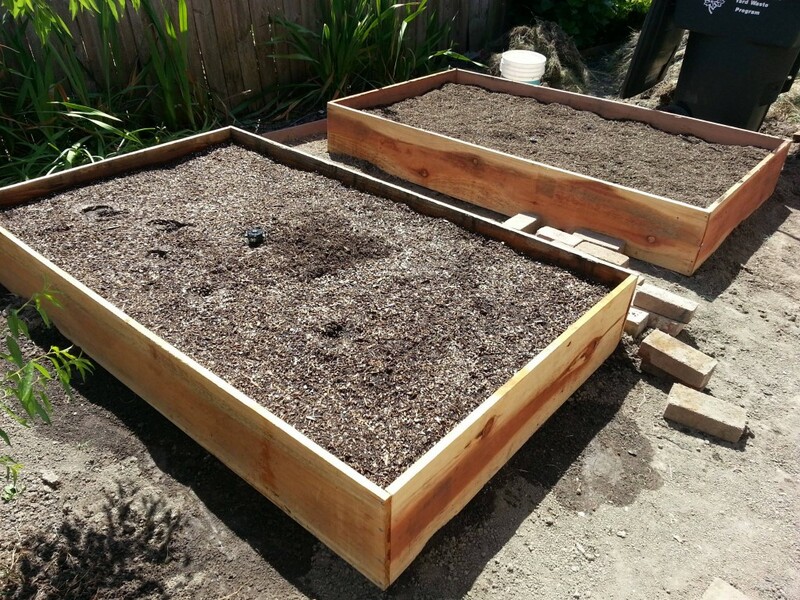 Once you have one raised bed, you’re going to want to build another. And then another. And another. And so on until you run out of room. Then, you begin considering unique shapes to get the most use out of your space. What, this didn’t happen to you, too? My initial foray into raised beds happened about 5 years ago. I put together a huge 22 foot by 6 foot raised bed and filled it with dirt and manure. Then this happened. I had never grown so many tomatoes, squash, cucumbers, beans, chilies, and eggplant in my entire life in such a small area. I wanted to do it again. More. Bigger. I had a hunger. A hunger for more raised beds. So I built two more 8 foot by 4 foot beds. I acquired some potted plants. I planted some trees. By now, I had a great growing space with enough produce to keep me sustainable during the summer months. I had enough food to eat every day, plus I could share with friends and family comfortable. Still, I yearned for more. I had several large trees in the backyard which were shading quite a lot. I couldn’t do much with those. As luck, either good or bad, would have it, they were stricken by disease and slowly died over the next few years. I planned and plotted. Pun intended. With the trees gone as of this year, the yard opened up to so much more space and sunlight opportunities. Looking back at my year over year creeping garden growth, I didn’t want the new areas of sunshine and garden produce to look so haphazard. I had a beautiful view of the yard from the house and wanted to balance between function and aesthetically pleasing. I knew I wanted to utilize raised beds. I had about 5 years under my belt of knowing what generally worked in my growing zone and yard. I’ve experimented with multiple growing techniques. Which of These Raised Bed Ideas Is Right For Me? For several growing seasons, I planted inside of straw bales. The bales decompose over several years and provide excellent aeration for the root systems. Plants seemed to do pretty well during the spring months, but once the hot Sacramento summers hit, I couldn’t keep up with the watering. This was no longer an effective method. From a visual and aesthetic standpoint, bales of straw did look pretty cool. For every year of my produce growing, I’ve utilized pots and planters from extra wood. I faced similar problems with the straw bales – the soil dried out incredibly fast during the summer months, often killing plants or keeping them from producing. In growing chilies, I had mixed results. Some of the chilies produced some deliciously hot peppers, and some really wanted that extra water to get past the flowering stage. I currently have my pots reserved for herbs, which make it easy to bring under cover during the winter and frost months. Keeping to raised beds became the easy choice. I could build something beautiful and keep the plants exceptionally happy. Raised garden beds offer so many benefits in organizing and caring for the produce. Can plant in groups instead of rows – or both! Having built and used both a gigantic raised bed and smaller standard sizes, I know the future raised beds will keep to a smaller size. In building one giant bed, I found there was a lot of wasted space and soil. Stepping on the soil compacts it, which defeats one of the main benefits. Keeping to a 4 foot width allows easy reaching from both sides. The beds are not narrow enough to dry out the soil quickly, and wide enough for 2 or 3 rows of plants, depending on what is being grown. I’ve considered going to 3 1/2 feet, however, that would waste wood, based on the standard lengths wood is sold by. The large bed used 2 inch thick redwood. The smaller beds used 1 inch thick redwood. The 1 inch lumber seemed to not hold up nearly as well, which was both surprising and disappointing. The future raised beds will certainly keep to a thicker board. With the opportunity to start fresh, I wanted to truly compare and evaluate different options. The first set of options were the primary materials. The decision would come down to price and planned aesthetics. Any of these materials would allow for organic gardening. A sturdy and aesthetically pleasing type of raised bed, the metal against soil will last much longer than untreated wood. It also will hold up a bit better than the occasional shovel hit. I’ve had redwood beds for about 6 years now and accidental shoveling seems to be the biggest wearer and tearer on the very soft insides from constant moisture. After writing this comparison post up, I ended up going with corrugated metal raised garden beds, as pictured above. The galvanized metal will leech a small mount of zinc into the soil, and poses no toxicity to human consumption. $15 per 2’x8′ corrugated sheet. 3 sheets needed. $30 per 2 in. x 6 in. x 16 ft common redwood for framing. 2 pieces needed with 8′ leftover. $20 per 4in x 4in x 8 ft common redwood for corners. 1 piece needed. Total cost: $125, plus screws and other misc hardware. Cinder blocks tie in really well with a mid-century modern look and offer a ton of flexibility in shape and size. The downside is they do require grouting and mortar if you want them to have nice lines. The blocks are prone to crumbling and breaking from the moisture and pressure, but are easy repairs. $2 per 16 in x 8 in x 8 in concrete cinder block. 46 needed. You will also need to fill the holes in the bricks with fill dirt so they don’t break from pressure and mortar the blocks together for a seamless looking structure. The photo above has un-grouted blocks which don’t hold the same aesthetics I am seeking, although I do love the triangles which would be relevant to portions of the yard. Concrete blocks certainly allow for more creative uses in space efficiency. Total cost: $72, plus mortar and fill dirt. Retaining wall blocks are a bit different than the concrete blocks. The retaining blocks can interlock, which means they have better stability during freeze-thaw-rain cycles and the expansion of soil. They are also much more decorative and can look beautiful. I love the looks of overflowing gardens with retaining walls. In searching around for examples and other gardeners experiences, it seemed like most gardens using retaining wall blocks were focused on curves and flowers. Choosing retaining wall blocks is certainly something which would add more value to the home. $2 per 4 in. x 11.75 in. x 6.75 in. 24 per level. 3 high to a foot high would be 72 blocks. No mortar or fill dirt necessary, as compared to a cinder block. $4 per 3in. x 8 in. x 16 in. tumbled top paver for the ledge. 23 total including corner accommodations. The use of stacked stone is akin to the stacked field stone walls I’ve seen throughout my adventures in the South, from Kentucky, Tennessee, and Georgia. They are breathtaking and versatile in use. Labor intensive with plenty of mortar, stacked stone is beautifully Mediterranean. Many gardeners going with this look have been able to successfully incorporate seamless water features and pathways. $3 per 16 in. x 8 in. x 4 in, built to 1 ft. high, requires 48 blocks. Total cost: $144, plus mortar. Wood beds are a classic standby. Beautiful and easy. However, there are a lot of different ways to go. Which type of wood? How thick do you want your beds? You can go 1 inch thick or 2 inches thick. After using both thicknesses, I certainly prefer 2 inches thick lumber for my beds. No matter which type of wood you end up using, it is absolutely important to only use untreated lumber. Redwood – easy to acquire at home improvement stores and available in 1 or 2 inch widths. 2 x 12 x 144 common redwood is $55, with 2 needed per bed. $110 total for a raised bed. 1 x 12 x 96 common redwood is $20, with 2 needed per bed. $40 total for a raised bed. Cedar – hard to find at the big home improvement stores in these larger sizes. Usually only found in prebuilt kits. A 4 ft. x 4 ft. x 7 in. kit from the local big box store was $70 and is modular. $140 total for a 4×8 raised bed. Black Locust – Exotic. Known as a type of decking which can last “forever.” Used for watercraft. Estimated price for 2 pieces at 1 x 12 x 96 is $180 total for a raised bed. The cheapest raised bed would be the 1 inch width redwood by far at $40. Past experiences has led me away from going that thin again. If you’re on a tight budget, that is the best way to go. Going full wood will also keep me at a lower bed, which I don’t want to do. 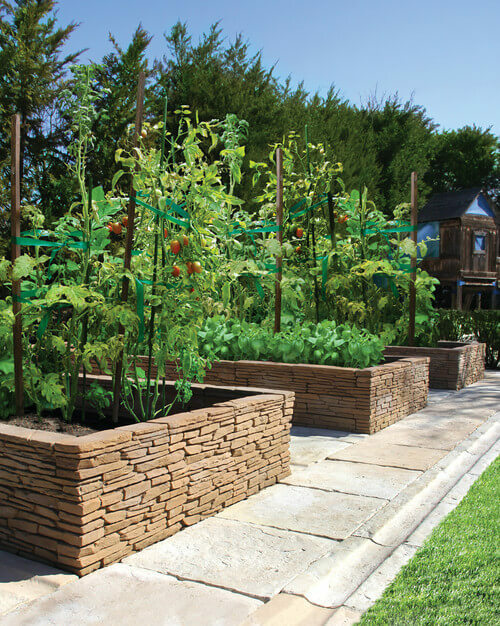 The most expensive raised bed is using retaining wall blocks, at $236. Considering how much space I intend to fill with a garden, this will be a bit cost prohibitive for my budget. I was pleasantly surprised by the cost of corrugated beds. The flexibility will be good for my funkily shaped yard. An additional consideration will be how corrugated beds respond to the slope and grading of my yard, which is far from level. I might throw some rock options into the mix, based on some ideas scrapped together from around the interwebs. From here, I’ll be measuring and putting down scrap wood to test layouts. Planting season is fast approaching within weeks – its time to get these hands dirty. In the end, I went with the corrugated metal raised beds. They turned out incredible beautiful. Read the full post about it here: How to Build a Raised Metal Garden Bed. I love raised garden beds – they give you so much more control over the soil that you grow your vegetables in and make things so much easier. Thanks for sharing! I used to live in a house with a ton of raised beds and was able to grow a few things. I miss it! It was definitely therapeutic. But now I live in an apartment and travel too much to garden, but I’d like to at least grow some herbs to have on hand for cooking. What amazing ideas and inspiration for raised garden beds! Now that my husband is about to retire, I may have to add a few of these to his honey-do list! Thank you so much for this comprehensive raised-bed-gardening guide! I’ve been wanting to do this but wasn’t even sure where to start! Such great detail thank you so much for sharing! Every Spring I tell myself I’m going to put in a raised bed and never do. This is a great post to get me motivated!! I’m going to share this with my husband! We’ve been talking about putting in some raised beds for a couple years now and this will be a great resource. Thanks! This is super cool. Would love to make my own raised garden bed one day!